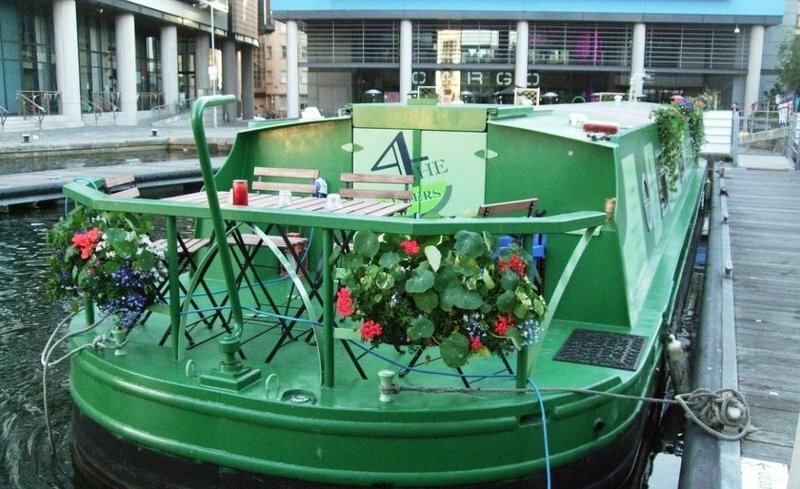 The Four Sisters Boatel – city centre luxury! 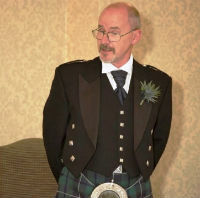 If you are on vacation in Scotland and are thinking of spending some time in Edinburgh taking in all the wonderful sights and sounds of this historic capital city then you will need somewhere to stay. You could, of course, book into one of Edinburgh’s many luxury hotels and rub shoulders with the rest of the tourist crowd or you could opt to do things a little differently – stay on a boat right in the middle of the city! 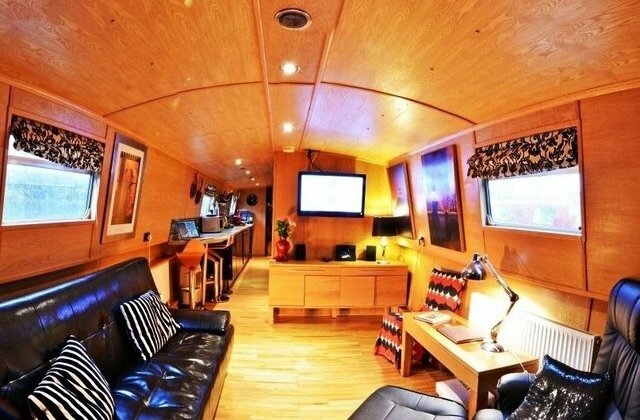 The Four Sisters Boatel is a luxury four star, self catering widebeam houseboat located in a strategic position near the heart of Edinburgh close to where the original James Bond (Sean Connery) lived as a child. Permanently moored on part of the Union Canal the boatel is a substantial vessel measuring some 55 feet long and is more than 10 feet wide with over six feet of headroom in her luxury accommodation. 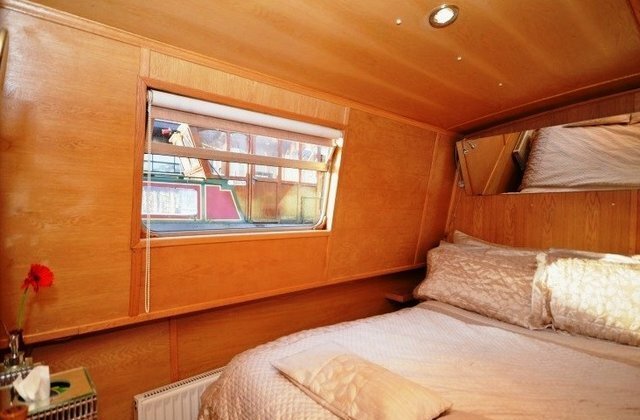 She can sleep four adults and two young children in comfort – with room for more if necessary. 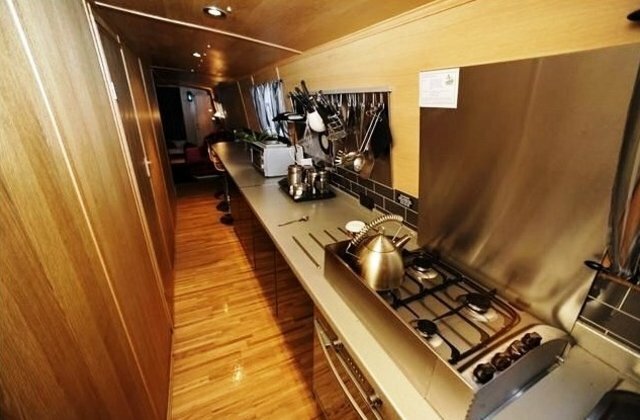 The Four Sisters Boatel is well equipped with modern conveniences including power shower, TV/DVD and a fully equipped galley kitchen with breakfast bar. The interior living space is surprisingly spacious and there is full central heating throughout so you will always be cosy even in the depths of winter and further electric heating is available if required. There is also a deck area with seating for six and facilities for you to have an on-deck barbecue. If you should choose to spend some of your precious vacation time staying on the boatel there are a selection of extras you may wish to try including welcome hampers ranging from a basic foodstuffs hamper to a luxury food and wine/spirits hamper or you could really treat yourself and go for the champagne on ice. Your choice will be on board and waiting for you upon your arrival. The Four Sisters Boatel can also cater for corporate events and private parties and there is the option of a luxury private dining experience with a meal cooked by an award winning chef during which you will be waited on hand and foot by your own personal serving staff – an ideal way to celebrate that special birthday or anniversary. How about a girls’ night? Pamper packages can be arranged with professional beauticians from a simple manicure to the full head-to-toe treatment – just the ticket for a special girls’ night with your friends! Located as she is near the heart of Edinburgh there is lots to see and do within walking distance or you could choose to simply chill out and enjoy this unusual but really quite fantastic alternative to a traditional hotel. She is in all respects an excellent example of modern high-tech, self-catering, luxury accommodation – which just happens to be a boat!